Christopher Anton Rea popularly known as Chris Rea is one of the greatest hitmakers of the 1970s and through the ’80s. He is popular for his gravelly voice, as well as for his hits such as Driving Home for Christmas and The Road to Hell. The British rock and blues singer-songwriter, guitarist, and actor is an icon in both the UK and the US music industry. He has released hit songs like Fool (If You Think It’s Over), which earned him a Grammy nomination as Best New Artist in 1979. Other notable songs include, I Can Hear Your Heartbeat, Stainsby Girls, Let’s Dance, Tell Me There’s a Heaven, and If You Were Me, a duet with Elton John. At first, he wanted to be an ice cream maker, as a way of continuing the family’s legacy. Then, he wanted to be a writer of films and film scorer. However, the environment he found himself in at the time was not one to foster his dreams. Rea was born in Middlesbrough, England, the UK on March 4, 1951, as one of the seven children (three boys, four girls) of an Italian father, Camillo Rea and an Irish mother, Winifred Slee. As a child, he spent a few months of every summer in Italy until the age of 12 when he got a job as a table cleaner and joined the family in making ice cream. He sought to learn more about the business so as to improve it but his ideas failed to earn his father’s approbation. At that, he left and his place was taken by one of his brothers. He also thought about becoming a journalist, which he said was his first passion. He believed he could have made a successful career therein because of his love for reading. At the age of 21, rather late for his new venture, Rea bought his first guitar and started learning how to strum the instrument. Although he was left-handed, he played right-handed; a mark of the true genius in him. With inspirations from Charlie Patton, Sister Rosetta Tharpe, Ry Cooder, and Joe Walsh, Rea developed a playing style known as slide guitar. He has since branched out from the guitar and learned other instruments. He also plays piano, keyboards, accordion, harmonica, Hammond organ, and mandolin. Armed with his guitar playing technique and signature husky grave voice, Guinness Rockopedia described him as a “gravel-voiced guitar stalwart”. Rea joined the local Middlesbrough band, Magdalene, in 1973, began writing songs for them and eventually became a singer as well. Later on, he formed his own band, The Beautiful Losers which received the Melody Maker Best Newcomers award in 1975. He went for a solo career after he secured a recording deal with Magnet Records, and the band split in 1977. His debut album titled Whatever Happened to Benny Santini? was released in June 1978 and produced by Elton John‘s record producer, Gus Dudgeon. So far, he has recorded 25 studio albums and 7 compilations albums with his 1989 album, The Road to Hell becoming his most famous and successful. 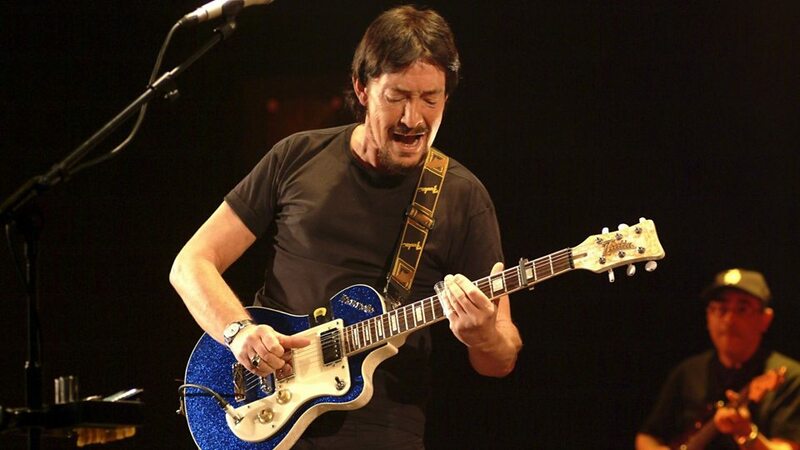 As of 2009, Chris Rea has sold over 30 million albums worldwide. Although he is an acclaimed rock singer-songwriter, the hitmaker mentioned that none of his musical heroes was a rock star. But he is very good at what he does which begs the question, what or who inspires him? Rea listened to Delta blues musicians like Sonny Boy Williamson II, Muddy Waters, as well as opera, and light orchestral classics. He refers to himself as a successful musician but never as a rock star, even with acclaimed success in the genre. In an industry where everything is volatile including longevity, the thought of one holding it together for a long time in one’s personal life is worth acknowledging. Chris Rea has somehow managed to build a formidable marriage with his wife, Joan through the years. The duo met as teenagers in 1968 in their native Middlesbrough and has stuck together since then. Their relationship is notable as one of the longest surviving in the music industry. They have two daughters – Josephine, born on September 16, 1983, and Julia, born on March 18, 1989. Rea has had to fight so many things in the music business as well as in his life – a succession of life-threatening illnesses is one of them. He was diagnosed with peritonitis in 1994 and six years later, with pancreatic cancer. From that point, he has undergone a series of surgeries, including a Whipple procedure by which he had his pancreas removed. The process further exposed him to diabetes and a generally weaker immune system; he even suffered a stroke in 2017. Amidst the myriads of drugs and injections he has to take daily, Chris Rea has had a cause to reflect on his life and living, stating that facing his own mortality has made him appreciate life, family, and the things he loves more. It was also during this period that he started doing what he had always wanted to do musically, concentrating on what really interests him. He changed his musical direction back to the blues root and also set up his own label named Jazzee Blue. Rea’s later songs such as Still So Far To Go, are spontaneous and tell how he feels about life. One of his childhood dreams was to become a film writer and film music scorer and although he is yet to write a film, he has composed a number of songs for movies and even acted in a handful. He wrote the title track and music score for Soft Top Hard Shoulder (1993), La Passione (1996) and played the lead role in Parting Shots (1999).